The model Px multiple tube flow meter line offers, the convenience and simplicity of 2, 3, 4, 5 and 6 tube meters, retaining most of the unique design features associated with single tube units (like our model P). 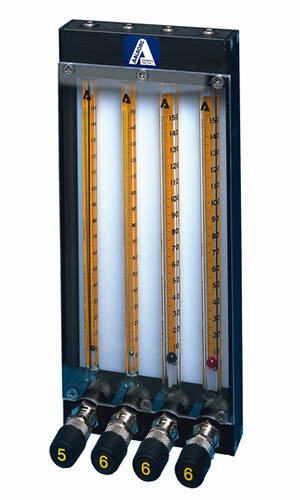 Multiple tube meters are available with 65mm or 150mm flow tubes. The same flow tubes as in single unit flow meters. Px meters are convenient for applications where several streams of gases or liquids are to be metered in individual channels, or manifolded. Shipped completely assembled, flow meters include standard mounting fittings in a choice of materials, side plates, thick protective front shield and back plate, optional built-in control valve, and flow tubes selected from the Flow Capacities tables in our catalog or with our online configurator. Panel mounting style is convertible to bench mounting through the use of the optional acrylic tripod. The tripod has a built-in spirit leveler and leveling screws. Meters may be supplied with built-in needle valves (CV™ ), high precision metering valves (MFV™) with “non-rising stems”, or with no valves. 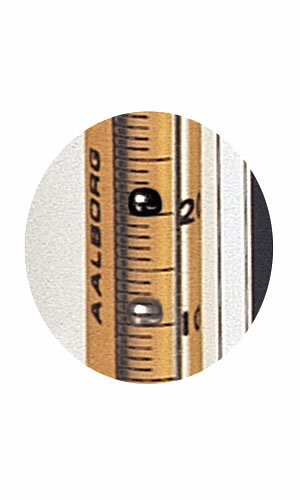 Generally for gas metering, it is recommended that valves are positioned at inlets (bottom) for liquids valves may be positioned either at outlets (top) or inlets. For vacuum service, valves must be mounted at outlets. If unspecified at the time of ordering, meters will be shipped with valves mounted at inlets. NOTE: The built-in-valves are always installed in the end block opposite to the manifolded one. Thus, if a meter is manifolded at the outlet, valves are installed at the inlets; if a meter is manifolded at the inlet, valves are installed at the outlets.